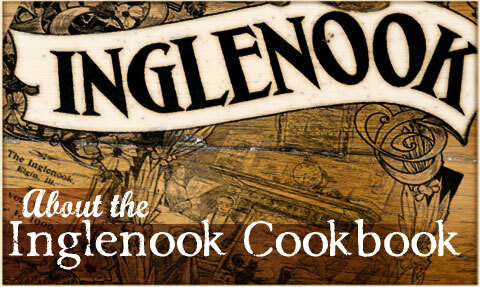 Welcome to the Inglenook Cookbook community! The Inglenook Cookbook has been a cherished tradition passed from generation to generation. The Inglenook Cookbook was first published by the Brethren Publishing House (now Brethren Press) in 1901, and contained 1,000 recipes from women in the Church of the Brethren, a Christian denomination known for peace, simplicity, and service. And good cooking! The cookbook was a gift given to subscribers of The Inglenook, a weekly magazine for all ages that provided entertainment and education on a variety of subjects from nature to history to current events. For one dollar a year, a subscriber received the weekly magazine and a copy of the Inglenook Cookbook. In 1911 a new revised edition with even more recipes was published. This revised edition became even more popular. Both the 1901 and 1911 editions were “bestsellers” of their time, selling more than 100,000 copies combined. By 1940 the children of those who supplied and used the recipes from the first two cookbooks were ready for their own—one that reflected their practical experience and included recipes fit for modern times. In 1942, thanks to their contributions, the Granddaughter’s Inglenook Cookbook was published. The Inglenook Cookbook legacy is one we are proud to share. The recipes contained in these cookbooks were tested in kitchens across America and selected for their value, excellence, and simplicity. The success of the series was its appeal to common people—those who embody the principles of simple living and value wholesome food. The new Inglenook Cookbook follows in that same tradition by assembling the best recipes from today’s kitchens to create a contemporary cookbook that reflects this heritage, upholding the values we share, and representing the tables of those who choose to live simply. Join our community of cooks, writers, and lovers of good food. We invite you to participate by submitting your best recipes. Share a memory about your experiences with food. Apply to be one of our Inglenook recipe testers. Pull up a chair next to the fire and stay awhile. Be warmed and filled. The Inglenook Cookbook: live simply, eat well.